Belokomitis belongs to the Municipal Section of Nevropoli Agrafa and the settlement of Kedros (Zygogianneika) is subjected here. 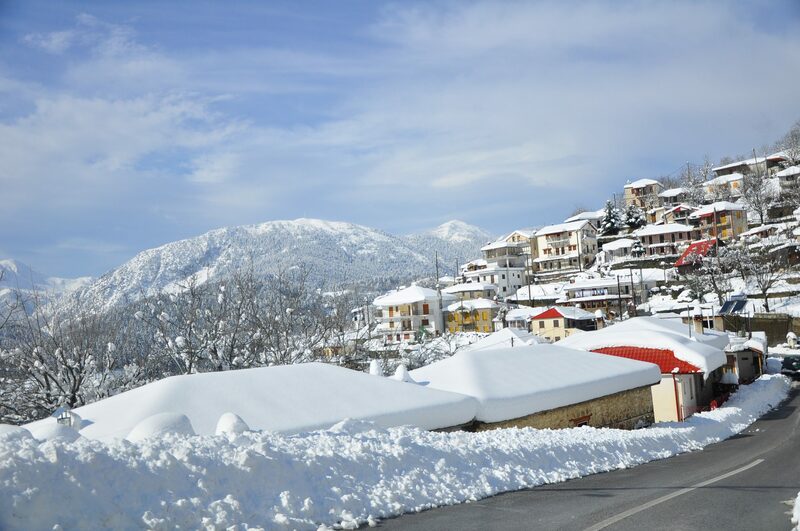 Its distance from Karditsa is 43 km and it is built on a hillside amphitheater of Agrafa at an altitude of 910 meters. The area has signs of habitation since the antiquity. At “Playa” an ancient indwelling has been identified – settlement of Dolopikos during the 6th century- and parts of the walls. A medieval settlement from the 6th century has also been found at “Panigiraki”. At “Paliospita” a settlement of 8th-10th century has been found. The village is located in its present location since the 12th century. At the 17th century it came under the church of Episcopi Neochori and Fanari. In 1830 Sarakatsanoi settled in Belokomitis. In the Turkish census of 1454 it was recorded as Pilokomitis with 24 families living there. The first seal of the Community in 1914 mentions the village as “Community Belokomitis” and it has as an emblem a DOLOPA peltast (archer). Since 1930 after the recommendation of the teacher K. Mpakolas it is written as Bellokomitis (in order to explain the name as Bella = beautiful & village = village or komitato). The residents are locals (from Agrafa and Sarakatsanoi) and the Sarakatsanic settlement was maintained until 1960. Durind the winter around 40 people live at the village, a number that is increased to 300 people during the summer months. They derive their income from agriculture (corn, vegetables, walnut, apple trees, crops, koftolivada), livestock and fishing. 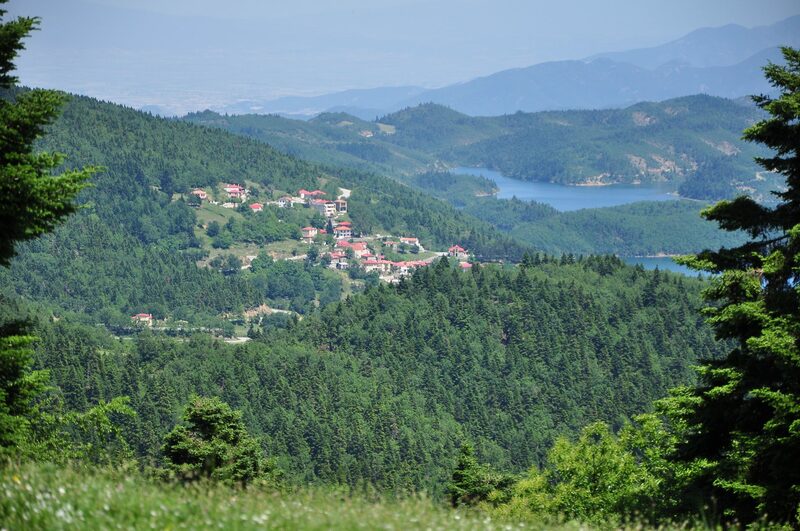 Before the construction of the Plastiras lake the residents of Belokomiti had fertile irrigated farmlands in the valley of Karitsiotis river. Belokomitis is surrunded by oak and fir forest with rich flora and fauna. The “Canyon of Kerentan” is an interesting area at Belokomitis that is a ravine opposite the village with rich forests of fir, beech and oak and streams with crystal clear water. The sources are “Sagani” at Scala, at the observatory in Ovro and “karakotrypa” at petrostrounges. The Karitsioti river has a length of 13km. It poures in the Plastiras lake and stems from Voutsikaki. The view from the peaks of the area is very beautiful. The cave of Gaki in the canyon of Kerentan has a depth more than 500 m.
Just before you reach the dam you can follow a path in order to go up to the observatory at “Palaiomonastiro”, where there are the ruins of the old monastery. From there, you can see the lake and the hole plain of Thessaly till to Olympus. The Church of the Twelve Apostles was built in 1925. However the old church had etched an inscription that was dated in 1657. The small church of St. George is located south of the village. The chapel of Prophet Elijah is at “Scala” and it was built in 1958. Three woodcut images of temples of the region are unique relics. Visitors today have the opportunity to see the old houses of Belokomiti with its carved wooden balconies and ceilings. The village celebrates on 29-30/06 in the memory of the Apostles. Also during the summer, the Cultural Association of the people who come from Belokomitis organizes various cultural events.